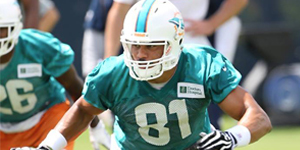 After taking only a one-year contract from the Miami Dolphins, TE Dustin Keller has officially been ruled out for the entire 2013 season after tearing his ACL, MCL and PCL, and also dislocating his knee in the Dolphins’ preseason game against the Houston Texans on Saturday night. The news was first reported by FoxSports.com. Keller’s leg bent awkwardly when he was being tackled by Texans safety D.J. Swearinger on an incomplete pass. Keller had just one reception for 14 yards in the game. 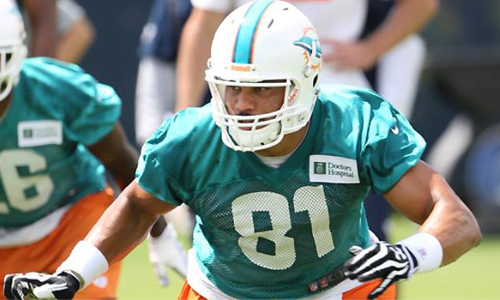 The tight end from Purdue spent his first five seasons in the league with the New York Jets before signing a one-year contract with the Dolphins in the offseason worth $4.25 million. Keller hoped he would have a productive 2013 and secure a long-term contract next year. In his five-year career, Keller has 241 receptions for 2876 yards and 17 touchdowns.